To the person that lives with diabetes, life has become quite more complicated already, having to suppress that sweet, sweet sugar crave. Needless to say, we are champions of hidden sugar consumption, with a bunch of seemingly innocent foods and drinks, such as salad dressings and ice tea, which contain copious amounts of the white crystals, or, worse, of the high-fructose corn syrup thingy. Thus, a rather restrictive diet has to be followed, as well as a fitness regimen, as the latest studies suggest your blood sugar is kept in check much better when you do simple short exercise sessions throughout the day, compared to lifting and running on the treadmill for hours on end few times a week. As smartphones have progressed to become our go-to advisor and companion, it's only natural that we'll be looking for apps for info and management of our blood sugar condition, that's why we are rounding up a few applications that might help in the daily struggle with diabetes. Developed as an interactive playground for your diabetic needs, this app sports one of the nicest interfaces in the category, yet doesn't skimp on the basics, too, like blood sugar levels logging and data analysis. 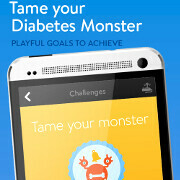 It even offers you challenges you must complete on the quest to manage the condition, complete with diabetes monsters, and smile-inducing feedback. Through the power of crowdsourcing, Social Diabetes also lets you upload and share your diabetes logs, learn from other users, and exchange recipes. Social Diabetes has it all, as it is a complete self-management system for Type 1 and Type 2 Diabetes Mellitus. Logging you meal plans, blood sugar levels and insulin needs gives you a good glimpse of how those foods affected you, but the app also offers more than 11,000 foods, their contents, and how would they affect your condition. CarboMentor is still in beta, but holds a considerable promise for those who want to use their iPhone as a the best way to keep log of their eating habits, and their diabetes in check. Food logging is more fun when you can snap pics of meals, estimate their carb count, tag and label them, and the app automatically remembers the location you had them in. CarboMentor reminds you to test the blood sugar levels after you eat, and can rate your carbohydrate estimation, too, for the next time you will be frolicking with that meal. Glucose Buddy is one of the most popular diabetes loggers out there, as it can track a number of variables that this condition requires, even weight and blood pressure. Moreover, it reminds you to check your BS levels, and sports day-by-day visualizations of your progress. Here's another one-stop-shop for managing your diabetic condition - Diabetes Pal comes with a pretty and easy to use interface, solid logging and charting options, and, best of all, it can retrieve the measurements from your Telcare BGM device, or you can enter them manually. Thus the daunting task of keep track of meals, insulin application, and blood sugar levels, become a tad easier, plus you can visualize the chronology of your readings in pretty graphs so as to quickly grasp what works and what doesn't.